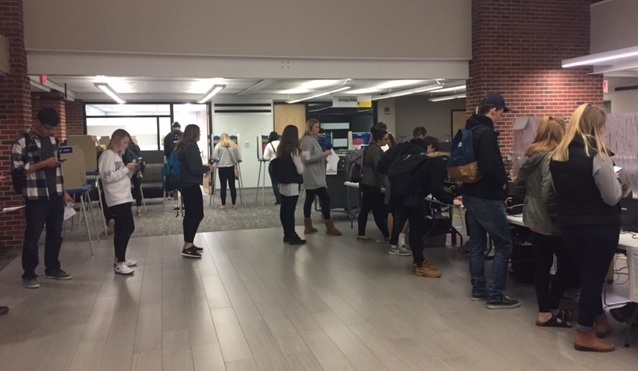 Voters line up at the University of Iowa Memorial Union to vote on Election Day, Nov. 8, 2016. The loss of 32 Iowa counties that voted Democratic in 2012 gave the Republican nominee Donald Trump the state’s six electoral votes. Last election, Obama’s win was attributed to the larger counties he was able to maintain from his 2008 win in the state, giving him 816,429 votes to Mitt Romney’s 727,928. But Obama lost 15 counties that he had claimed in the 2008 election. Woodbury County was the only Iowa county that voted Republican in 2008 to switch to Democratic in 2012, an outlier in the western part of the state that famously votes Republican. This year, Woodbury reverted back to voting Republican, with 56.6 percent of votes cast for Trump. “Among certain Republicans in Woodbury County in 2012 there wasn’t a lot of support and enthusiasm for Romney,” Robert Stewart, 34, a lawyer from Sioux City, said. Stewart predicted in mid-October that Trump would win Woodbury County and the state as a whole. “I just see a lot more enthusiasm among Republicans for Trump than I do Democrats for Hillary,” he said. One reason for this loss could be a lack of strong campaigning in western Iowa by Democratic nominees, voters interviewed by IowaWatch said. 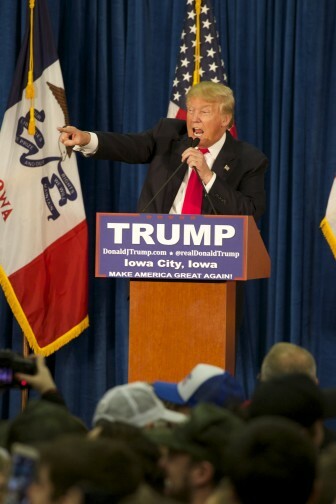 Republican President-elect Donald Trump at a Jan. 26, 2016, campaign stop at the University of Iowa in Iowa City. Mertes, a Clinton supporter, said he expected Iowa to cast more votes for Trump and was disappointed by this. “I live in Steve King country, so I’m kind of surrounded by people who don’t think like me,” he said, referring to the stalwart Republican congressman from Iowa’s 4th Congressional District. Jasper County was among the counties where Clinton lost but Obama won four years ago. In 2012, Obama won the county with 52.8 percent of votes, compared to Romney’s 45.7 percent. This year, Clinton claimed just 37.4 percent of votes in Jasper compared to Trump’s 55.5 percent. 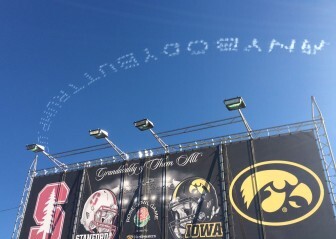 President-elect Donald Trump overcame massive attempts to defeat him, including this effort using five airplanes spelling out anti-Donald Trump messages during the Jan. 1, 2016, Rose Bowl parade before the annual Rose Bowl football game in Pasadena, California. Cerro Gordo County also largely shifted party lines. Obama won 55.6 percent of the vote in 2012 while Clinton claimed just 43 percent of Cerro Gordo’s votes to Trump’s 50.6. The state’s capital, Des Moines, was a prominently Democratic county in 2012, with 57.9 percent of the votes going to Obama. This election, Trump won the county with 49.9 percent to Clinton’s 43 percent. The counties Clinton won this year were Black Hawk, Johnson, Linn, Polk, Scott and Story. This IowaWatch story was republished by The Gazette (Cedar Rapids, IA) and Council Bluffs Nonpareil and reporting from it appeared in the Estherville News and Ames Tribune under IowaWatch’s mission of sharing stories with media partners.